After two years in Spain he joined the team of el bulli the 2005 by then the best restaurant of the world he worked with Ferran Adria one year. The 2006 after a small stop in Luxemburg to consult a small luxury restaurant he travel to Paris and studied in le Notre escuel de cuisine there he formed into the basics of pastry then he went back to the island of Tenerife to open his first restaurant Alkimia, a small project with 4 tables and no waiters ,Dimitris behind the bar was making his alquimies with a quality plates ,serving and cleaning it, was one man show for a year, the second restaurant came up the year 2007 Siphon was open, Dimitris more solid created a Greek modern cuisine cooking with almost everything a la minute. The 2010 had an offer to join the team of Albert Raurich ( ex-chef of el bulli) in the restaurant Dos Palillos a very innovating Asian tapas bar in the center of Barcelona with one Michelin star. The chef coming back to Greece was leading the team of sea you up in the Sani marina resort the years 2011 and 2013 with a personal Japanese fusion cuisine. 2013 Dimitris start a project in London with a friend chef a Greek tapas restaurant with a modern twist. At 2014 the chef presents the Nikkei cuisine in Athens with base the Oozora restaurant . 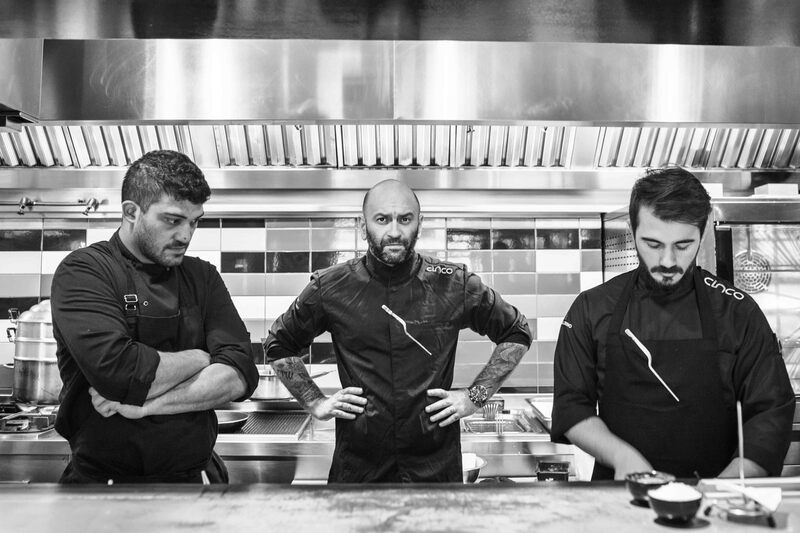 actually Dimitris is the executive chef of Cinco restaurant in kolonaki Athens, and he presents there the concept of jsp (Japan, Spain and Peru) an Avant Gard presentation of Nikkei cuisine mixed with Spanish and Greek influences.